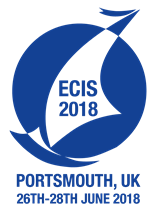 The ISE Research group will be present at the 25th European Conference on Information Systems (ECIS-2018) in Portsmouth, UK with 9 accepted papers in the fields of digital experience (chatbots, attentive user interfaces, digital nudging), electronic markets (prediction markets, robo-advisory), IS engineering & transformation (data-driven business model tools, process standardization measurement). Furthermore, Jella Pfeiffer and Stefan Morana are organizing a workshop on „Designing User Assistance in Interactive Intelligent Systems“. Gnewuch et al. (2018). Faster is Not Always Better: Understanding the Effect of Dynamic Response Delays in Human-Chatbot Interaction. Haake et al. (2018). Operationalization and Measurement of the Concept of Effective Use. Kloker et al. (2018). The Effect of Social Reputation on Retention in Knowledge Sharing: Designing a Social Real-Time Delphi Platform. Teubner T and Glaser F (2018). Up or out - The dynamics of star rating Scores on Airbnb. Reuter-Oppermann et al. (2018). Assessing information requirements for complex decision making in healthcare. Augenstein et al., (2018). Designing for Business Model Comprehension – Principles for an Extended Business Model Tool. Wurm et al., (2018). Development of a Measurement Scale for Business Process Standardization. Jung D, et al. (2018). Nudged to win - Designing robo-advisory to overcome decision inertia. Huber J et al.(2018). Nudging Flexiblity - Increasing Electric Vehicel User's Charging Flexibility with Digital Nudges.